I gathered a few questions and answers about natural cork from the world wide web. Whether true or not, they make us think about our recycling obligations. The wine industry has introduced other ways to protect wine after finding its way inside the bottle. Those are synthetic stoppers and aluminum screw caps, both scientifically proven to be as good, if not better than natural cork. I guess I do have a preference for natural cork but ultimately, what really matters in the end is the wine itself. Regardless of the method used to keep the wine safe, it always comes down to being responsible… Drink responsibly; recycle your corks, synthetic stoppers and screw caps accordingly. Q: Does cork harvesting kill or damage the tree? A: No. Cork trees are not harmed when the cork is harvested. The first harvest happens when the cork tree is about 25 years old, then can be repeated every 9 or 10 years until the tree is about 200 years old. This makes natural cork completely sustainable. Q: Are we running out of natural cork? A: No. Cork groves in Portugal alone can supply enough natural corks to last more than 100 years. Q: Are synthetic stoppers better for the environment? A: No. When you look at the entire production process, synthetic (plastic) stoppers release 10 times more emissions than natural cork. Q: What about aluminum screw caps? A: Aluminum screw caps release 24 times more emissions than natural cork, not to mention the recycling issue which continues to remain a problem for the environment. Q: How many natural corks are produced each year? A: Annual production of natural corks is ~13 billion. That’s about 14 million cubic feet of wine corks. That’s enough to fill 69 Goodyear Blimps and a total weight of about 48,000 tons. Q: Is wildlife displaced by cork harvesting? A: No. Cork groves provide wildlife habitat for many species, including several endangered species such as the Iberian Lynx, whose population is now around 100 animals, making it the most threatened cat in the world. Q: Are cork groves good for the environment? A: Yes. Cork groves absorb atmospheric CO2. Groves in the Andalusian forests of Spain alone absorb over 16 million tons. Because CO2 is stored in the cork bark, trees that are harvested absorb 3 to 5 times more CO2 than trees that are not harvested. Cork groves also help combat the steady expansion of deserts around the mediterranean. Q: Will increased use of synthetic stoppers and aluminum screw caps reduce the pressure on natural cork production? A: If demand for natural cork drops because of increased use of synthetic or aluminum stoppers there is a risk that cork groves will be replaced with quick cash crops. This will result in a loss of a low-impact, renewable, sustainable forestry practice and all of its related environmental benefits. The net effect will be accelerated environmental impacts. 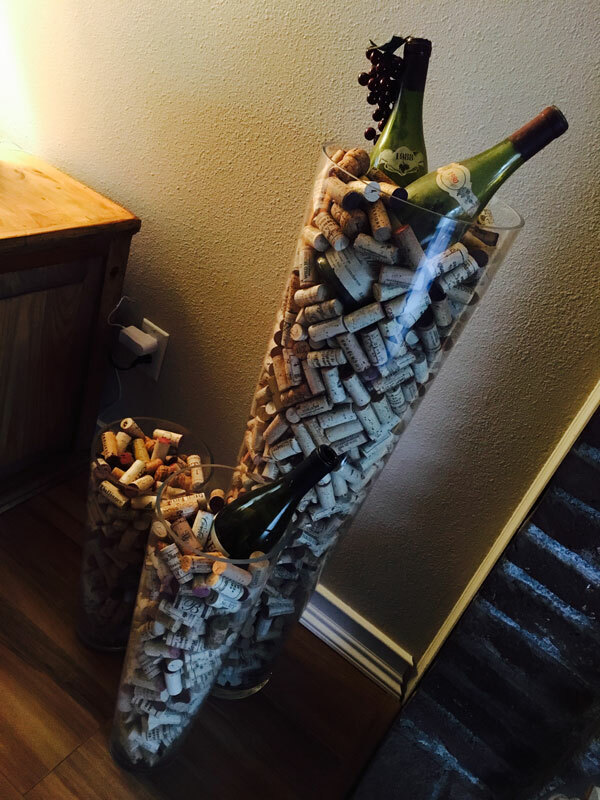 Need some recycling ideas for your corks? There’s a handful of organizations that will gladly take your corks. They recycle them and turn them into post-consumer products, such as insulation, flooring, wall coverings & interior decorating. Some grocery stores will also take them. Whole Foods Market works with an organization called Cork Forest Conservation Alliance (corkreharvest.org). So next time you go shopping for more wine, bring your corks with you! Cork is a renewable, recyclable material that doesn’t belong in our landfills.